In 2013, Bernard Clark introduced a new series of portrait work (after his remarkable “Tatto Portraits”) that focused on Kingston Artists. The subjects were visual creators. Now, Clark has expanded that series beyond the visual and into the audio to include a Music Portfolio. Among those stepping up to be captured by Bernard’s lens are Emily Fennel and Dave Bidini. One of the creators photographed in the visual artist series was local sculptor Rick Lapointe. When considering the introduction of Bernard’s new works, we couldn’t help but think of Rick’s steel works. All we could think is that they would look great together. And so . . . photo + steel = a good match. ‘The Music Portfolio’ is one I have been working on for the past year. It comprises a series of portraits of Canadian musicians mainly from the Kingston area. The majority of portraits are shot in a studio and then digitally dropped into a new environment. A few are shot on location. For the most part these portraits are very simple and uncomplicated. The musicians are seated directly in front of me, many unclothed and they look into the camera with minimal expression. The simplicity of the pose combined with the new environment produces some striking images. This series is a continuation of my work that I exhibited last year at Studio 22 Open Gallery, portraits of visual artists. I have always enjoyed collaborating with other artists and I appreciate those who have sat for me in this most recent portfolio. Bernard was born and raised in Kingston, and since childhood has had a strong interest in visual arts. He bought his first 35mm camera in Grade 10 and within a year was processing and printing his own black & white photographs. He graduated in Fine Arts from St. Lawrence College in 1986, with his major study being photography. Bernard has been heavily influenced by the master portrait photographers Richard Avedon, Irving Penn and Annie Leibovitz. Clark has been exhibiting his fine art images for the past 25 years in several solo and group exhibitions. His work revolves around two distinct themes: Portraits of people in society who share a common link, and architectural studies of buildings in various states of decay. In 2012 Bernard had a 4 month solo exhibition at the Agnes Etherington Art Centre ‘Tattoo Portraits.’ The exhibition was accompanied by a significant catalogue that is available at the AEAC and the Museum of Modern Art. 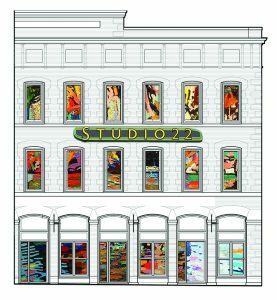 His most recent 2013 show at Studio 22 Open Gallery included portraits of Kingston artists which have been described as “monumental and unsettling”. The works of Kingston-based sculptor Rick Lapointe are held in numerous private collections in Canada, the United States, and Australia. His sculptures have been featured in solo and group exhibitions, at the Interior Design Show (Toronto), at the Gananoque & Oeno Gallery Sculpture Parks, and have been featured in a major Hollywood blockbuster. A self-taught artist raised in Montreal with a background in fine woodworking and blacksmithing, Lapointe is captivated by the malleability of steel and explores the unpredictable principles of deconstruction, accident and balance. When viewers consider metal sculpture, it is often with the idea that welding is an industrial process and is therefore obliged to produce industrial forms; however, I like to improvise with steel. By using manufactured steel parts in an abstract way, I have created an expressionist assemblage exploring the unpredictable principles of deconstruction, accident, and balance, demonstrating the inevitable outcome of order.